A marvel in white.... Taj is the epitome of love. The grandeur called the Taj is perhaps the most photographed, filmed, described and sketched building of the world. Taj Mahal is where fantasy coincides with reality in perfect harmony. An inspiration for innumerous artists over the centuries, the Taj is an ode to love. An epitome of love the world has ever seen which no monument in the world can match. The splendour and the beauty of this pleasant edifice brings one back to experience the magic of this majestic structure. The beauty of the Taj is in its simplicity. It is rare that a person would not fall in love with the pure and simple beauty in white. Emperor Shahajehan had built many an architectural marvels in his career, but Taj Mahal is the zenith. The world heritage site and the seventh architectural wonder of the world, Taj Mahal is different from the rest. The emperor loved his wife Mumtaz dearly. When in 1631, his wife died giving birth to their 14th child; Shahajehan lost the charm to live. It was then he decided to build a mausoleum for his beloved which the world would remember. And indeed Taj Mahal mesmerizes everyone who visits it. Shahajehan employed best artisans and architects to work on the masterpiece. Finally, 22 years later, with 20,000 workers toiling day and night stood the world’s most beautiful monument, and was called the Taj Mahal. It is said that the world is divided in two parts, people who have seen the Taj and those who have not, such is the glory of this great monument. The subtle beauty of the Taj is the main reason that tourists from all over the world come here, again and again. The structure of Taj Mahal adheres to the Indo Islamic architecture, which flourished in India during the medieval period. It is said that the structure was based primarily on the structure of Humayun’s tomb in Delhi, which was culminated in precision with the building of the Taj. The mammoth entrance gate built in red sandstone is a beautiful inscribed with texts from the Koran. They are beautifully written in absolutely uniform size from whichever angle you see them. After passing the gate you enter in to the exquisitely laid gardens with symmetrical designs and fountains built in red sandstone with the majestic Taj standing nearly thousand feet away. The Taj stands atop a plinth with four minarets in each corner. The central dome is huge supported by four smaller domes. The elegantly carved arches and the floral designs, not only intricate, but in perfect symmetry is the highlight of Taj. The exquisite tracery looks more like lace than actual carvings. Earlier precious and semi-precious stones were laid inside the floral designs, a very typical form of craftsmanship known as the pietra dura. The Taj overlooks the Yamuna and on a quiet day one can hear the water flowing by. As it stands on a raised platform with the blue sky as its backdrop, it gives an impression of a palace floating in the air. The Taj never looks the same at any time and from any angle. The colour of the Taj changes with every change that takes place in the sky. The golden pink Taj at dawn turns into dazzling white at noon. Giving way to the sultry orange at sunset is the milky blue at night. Viewing the Taj on Full moon nights is a blissful experience. The Taj seems to be bathing in the moon light with its fine designs getting illuminated further. The reflections of the Taj in the water pond in front of it or in the Yamuna waters in the back are some of the breath taking views. And actually the life after the Taj is different with a feeling of fulfillment with no blemishes, a feeling of ecstasy having experienced a beautiful monument, a feeling of contentment having viewed the flawless magnificent edifice. Situated in the city of Agra, the nearest airport is Delhi. 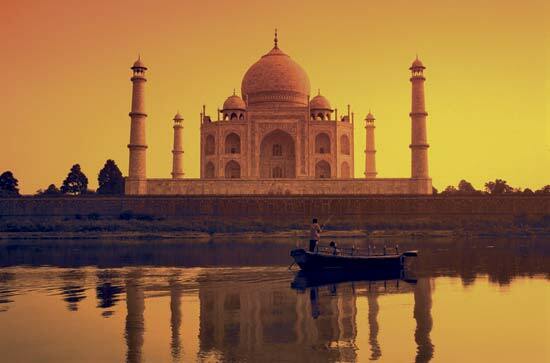 A joint trip to Delhi and Jaipur along with Agra, gives you the famous Golden Triangle trip of India.